A dramatic change has taken place in the world of web design following the vicious and relentless hacker surge of 2016. Our graphic illustrates the worldwide web connections and security vulnerability points involving hardware and software. 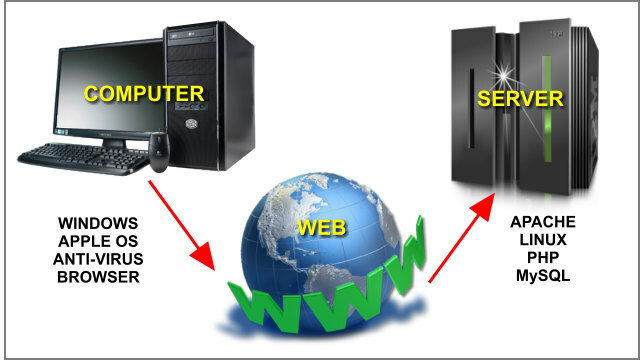 Besides a design, web developers must advise small business clients about security awareness, strategy, and action plans. No site is immune. It is a mistake to think “hackers will not target small sites like mine”. The exact opposite is true. Most want to be parasites hiding on your server. They can’t be traced, and use your site as a shipping point for malware. I had recovered a few hacked sites over the years. It happens, yet the hacker surge of 2016 affected 40% of my clients! More client sites were hacked in 2016 than the previous 15 years combined. Worldwide hacks in 2016 averaged 37,000/day. In response, I spent over 1000 hours in 2016 developing a strategy to deter hackers, and quickly recover hacked websites. The security plan on 20+ sites since August 2016 works. Sites are protected, yet log files show 100% are being attacked! Hacking will continue to surge in 2017 for all chip devices like smartphones, home security systems, and even smart tvs. The key to avoiding a hacking event is security awareness for the future, and on an individual basis, not just business. Prevent hacks? No one is immune. The challenge developing my security plan was avoiding the high cost of security staff. For my clients, what is different is having a security firewall and event logs to detect any malicious files or edits. Manual recovery averages 15 hours. Daily monitoring with the security system is instantaneous with recovery in 5 minutes! This cost effective solution for small business owners provides recovery without hiring a fulltime security professional. Footnote: The hacker surge of 2016 was an unbelievable wakeup call, and the hacker attacks in 2017 will likely continue.